When Ontario’s beekeepers opened their hives this spring, they found nothing but bad news for beekeepers, as well as for the vegetable and fruit growers who depend on bees for pollination. 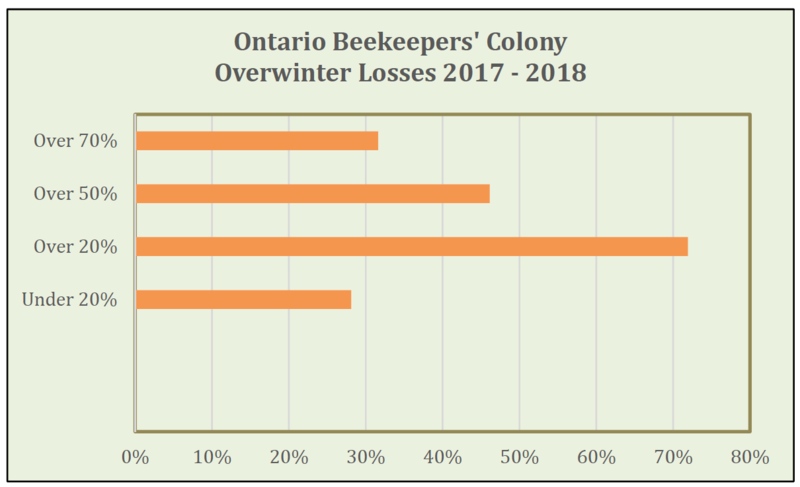 The recent Ontario Beekeepers’ Association survey of almost 900 beekeepers indicated that seven out of 10 Ontario beekeepers suffered unsustainable losses. Most worrisome, almost one in three (32%) beekeepers reported colony losses of 70% or more. After a typical winter, beekeepers recover their losses by splitting hives and adding new queens to make new colonies. When losses exceed 20%, beekeepers incur extra costs for the purchase of new queens and bees. Losses over 50% can be catastrophic. Colonies will be in recovery mode all summer and beekeepers will receive little or no income from pollination services or honey production. One in four beekeepers has said that “if these losses continue, I cannot continue in the beekeeping business.” To help commercial beekeepers stay in business, the OBA has asked the Ontario government for financial assistance to allow beekeepers to recover and rebuild their colony numbers back to last year’s numbers. Beekeepers estimate that their bees are at least four to six weeks behind where they should be at this time of year. Despite legislation adopted in Ontario to reduce their use, neonics are still being used on 75% of Ontario corn and soy crops, despite the government’s goal of reducing usage to 20%. Heavy overwinter losses and cold spring weather will also hold back Ontario queen producers and sellers of bees relied on to replace lost colonies. Most queen producers cannot fill new orders until July, which is late in the season. Beekeepers are finding that surviving colonies are not strong enough to use to build back their colony numbers. Loss of colonies, failing queens and a slow colony build‐up means fewer colonies are available to pollinate Ontario’s fruit and vegetable crops. Honey bees are responsible for 90% of apple production. (4) Almost $900 million worth of Ontario’s fruit and vegetable crops rely on bees for pollination. (5) In addition to their importance for food production, pollination services are an important part of a beekeeper’s income.